And if you don’t catch me at these panels, I’m sure you’ll catch me at others or roaming the halls or in the con suite. Step up and say hi! I think I had the most fun I’ve ever had at Boskone as a part of this year’s program. I probably could’ve done a better job moderating “So You Wanna Be a Time Lord.” Things got a little heated near the end, but I think most folks walked out with smiles. “The Horror Boom and the Second Wave” and “Fear Factor” panels were great fun and I’m wondering if that was so because my point of view on these topics was that of a fan, and not so much as “a fantasy/sf writer.” I did have occasion to let that perspective sneak in a couple of times; that was cool, too. I was down with OPP (Other People’s Panels) this year, too. I probably need to lay off the various “writers on writing” panels at cons, though — not because I feel I have nothing to learn but really, my further learning needs to be about doing at this point. Still, I did pick up a couple of real gems. The other was Roger Corman’s 1963 adaptation of THE RAVEN. C’mon, who doesn’t like that one? I’d actually forgotten that Richard Matheson wrote the screenplay, and that a very young Jack Nicholson was in it, too! I succumbed to Boskone Twitter’s (implied) dare to adopt the busted Baphomet statue I found in my apartment complex’s laundry room and use it as a prop for the piece I performed for the Villains Open Mic slam. This is the second year in a row that someone suggested I do something with the pieces I performed. Maybe this year, I’ll listen. I wonder what I’ll have to cook up next year? I’ll be at Boskone in February for two out of its four days and again, they’ve allowed me to take up space in the program! Here’s where you can find me — come say hi! The time for a new Time Lord is fast approaching. Peter Capaldi is on his third season, which means his stint as The Doctor is likely nearing an end. We’ve seen speculation about casting the next Doctor, but maybe Capaldi isn’t ready to go, especially since his character is starting to gel. What are our hopes for the future? Do we want to keep Capaldi? Whom would we like next? Maybe we can even ask our panelists why they might make a good Time Lord…. Horror boomed in the 1970s and 1980s, before fading into subplots within romance, SF, and fantasy, as critics proclaimed, “Horror is dead!” Fortunately, horror is too clever — and necessary — to be beaten by Death. In fact, horror is back, bigger and badder than ever! The Second Wave of horror is hot, and it’s unabashedly horror again. What drove the first horror boom? What “killed” it? What fearsome forces are driving this Second Wave? H. P. Lovecraft says, “The oldest and strongest kind of fear is fear of the unknown.” Peter S. Beagle says, “It is the shadow that terrifies, not the monster it hides. The monster is an actor in a monster suit. The shadow is always real.” Should moviemakers reduce screentime for their favorite CGI monstrosities? Should horror writers concentrate on explaining the really scary stuff less? What storytellers excel in making us jump at shadows? Live from Boskone… enjoy the unsavory stylings of our program participants and audience members. They share their open mic skills in the second annual Boskone Open Mic, which this year features our favorite fictitious villains! Each person gives his/her best 5-minute villainous performance — story, poem, song, skit, interpretive dance, or whatever! I’ll always remember Boskone 53 as “The one where the Guest of Honor bought me drinks, to say nothing about all the other connections and, more importantly, the re-connections I made with folks. I don’t think I knew just how much I needed that. Between that and participating lots in the program, I had a great time! If nothing else, the mask I wore to the Superhero Open Mic (where I did a monologue from a Cleveland hero) helped me purge decades of negative feelings about never having a decent Halloween costume that would accommodate eyeglasses! God willing and the creeks don’t rise, see you next year! BOSKONE 53. In case you missed it, I’ll be in Boston this weekend, doing the panel/reading/drinking thing. I won’t be hard to find, so come say hi! COMING SOON. A short essay of mine will appear in THE CLEVELAND NEIGHBORHOOD GUIDEBOOK by Belt Publishing, which drops in May. It aims to be “… the most useful, least authorized resource for Clevelanders, Cleveland ex-pats, visitors, and potential new residents.” And to that end, I plugged a small corner of my former patch of Greater Cleveland. Accessing information about DC and Marvel releases is pretty straightforward. But what are the other must-read comics that might be flying under your radar? Whom should you keep your eye on? The comics universe is always expanding; which are the new voices you mustn’t miss? Sometimes the hero of a story isn’t its true protagonist. A commonly accepted example is Sam Gamgee in The Lord of the Rings, who more and more centers the action as the story concludes. What other examples occur to us? Why might an author choose to focus on someone other than the hero? Can the hero ever be the antagonist? Podcasting gives us an outlet to share our thoughts and ideas with the world, and everyone seems to have something (perhaps a lot) to say. But is podcasting right for everyone? How do you go about “bootstrapping” a podcast? What do you need and what do you need to know? How do you attract and keep an audience? Where do you find a place to host your site? Successful ‘casters pass on their secrets. The binge-watching phenomena has clearly changed the way we watch television, in-genre or out. Is it also altering the way they create it? Marathon viewers are a mindful audience, who retain more information and understand longer story arcs. Is this leading to more complex characters, more complicated plots — more compelling shows? Kapow! Live from Boskone … enjoy the knock-out stylings of our program participants and audience members who share their open mic skills in the first-ever Superhero Open Mic. Each person gives his/her best 5-minute superhero performance – story, poem, song, skit, interpretive dance, or whatever! OPTIONAL: For extra appeal, feel free to come dressed as a superhero! The anger of the Norse Frost Giants that turned Boskone into “Snokone” conspired to make me arrive late and leave early. On the other hand, thanks to programming (who did an AWESOME job! ), I did more in the short time I was there than at past cons. Since my time was short and sweet, so shall my write-up be. Here are the panels I was on or attended, and what I took away. OFF THE AIR: I was off the air for this one, much to my regret. Heard it went well, though. Curse you, Boston traffic! FATHER, YOU MADE ME: Archetypal/non-archetypal parent-child dynamics. Fathers creating/spawning children from nothing (rather than a mother), eating them or risk being eaten. Mothers who are either evil queens and rivals, or absent. There are created fathers in the Hero’s Journey, where are the replacement mothers? In fact, why have a story structure where a parent abdicates and is replaced? Market concerns? And where did the Female Hero’s Journey go, anyway? Parenting “then” is different from parenting “now”… isn’t it? What can speculative fiction do that literary fiction can’t vis-a-vis depictions of parenting relationships. A good amount, it turns out. Also, first time I’ve ever moderated a panel but it felt like cheating to have an all-star crew; it practically moderated itself. READING: Yes, my first official con-sanctioned reading. Two short pieces and an excerpt and people showed up! FINDING DIVERSE FICTION: Google is your friend. But thank small-press/independent publishers going against Publishers’ (capital P) professional knowledge (i.e. self fulfilling prophesies) on “what sells “. How do you get Pulitzer Prize-winning literary authors of color and well-known genre authors of color for your anthology created with an eye toward increasing diversity? Apparently, just ask. Writers, keep writing. Readers, keep reading AND financially backing AND BUYING! NON-WESTERN FOLKLORE: This was the only panel outside of my own that I got to attend: Fairy tales vs. folklore vs. fables. The hacking of folklore; reverse-engineering written lore (back) to oral traditions. “Authenticity of”, “Ownership of” — both colonized concepts? How great was the Great Wall before Westerners called it great? Transformation. Unequal power differentials vis-à-vis appropriation, IP, copyright issues (i.e. what can be copyrightable? Says who?). Would’ve sucked for Ovid creating THE METAMORPHOSES. [Possession really is 9/10ths of the law.] Modern tabloids as repositories for modern folklore [i.e. a lore of the people, rather than folklore curators]? THE JODOROWSKY EFFECT: Much like Jodorowsky’s attempt at making DUNE, a great panel that could’ve been, that couldn’t happen because of external realities. 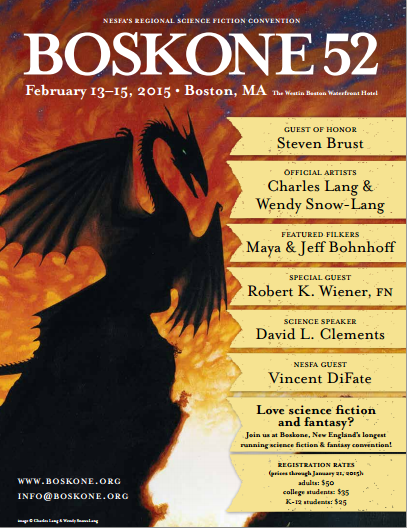 Yes, I’ll be at Boskone this weekend, weather permitting. And not just barconning it, either. I have actual panels AND a reading!! Why does good television fail? Panelists talk about SF/F/H TV shows that died too soon, including Firefly, Alphas, The Tomorrow People, Millennium, Jericho, Almost Human, and more. Were they as good as we think? What are we missing? From Dr. Frankenstein and his monster to Darth Vader and his son, speculative fiction uses fantastical ways to explore the special relationship between fathers and sons. What about the relationships between mothers and daughters? Panelists explore notable parental relationships within fiction and how those relationships shape characters and the choices they make. There is a clear desire for increased diversity within SF/F fiction and fandom. There are also a lot of emerging writers who are bringing diversity to the genre, but many of them are still flying below the publicity radar. Authors and publishers come together to share their “must read” lists and tips on where to find some of the new up-and-coming authors. Now that the zombie craze has peaked, and every major comics publisher has delved into horror-related titles, how has this impacted the mainstream’s monthly superhero titles? Does rampant fan interest in The Walking Dead eclipse the latest issue of Superman, Batman, X-Men, or Avengers? We’ll take a look at current comics trends, to see what types of comic books are winning the battle for readers. Alejandro Jodorowsky, a Chilean filmmaker, author, and surrealist, influenced some of the greatest cult SF/F works of the last 60 years. He directed the first midnight cult film (El Topo), his comic series The Incal inspired The Fifth Element, and he spearheaded a failed effort to film Dune — “the greatest SF movie never made.” Jodorowsky’s production art for Dune inspired Star Wars, Alien, Heavy Metal, Raiders of the Lost Ark, and others. His other work is also critically acclaimed and hugely influential. Panelists discuss Jodorowsky’s legacy, his “Psychomagical Realism, ” and his influence on contemporary work. Come find me and say, Hey!